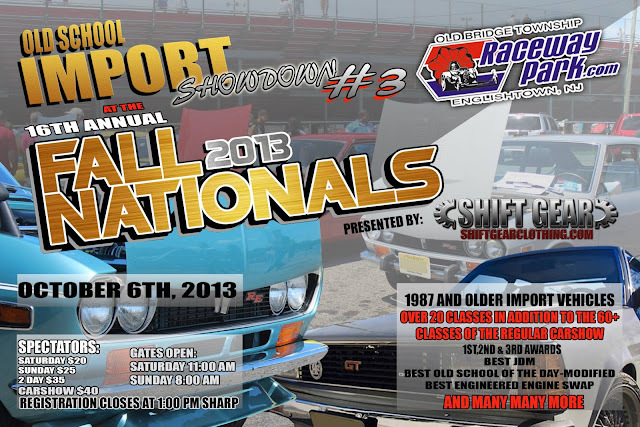 Shift Gear is proud to present for the third time at Englishtown Raceway Park an all Old School Import car show featured in conjunction with the great 16th Annual Fall Nationals Car Show. This show is a part of the huge 60+ class car show that is open to all Makes, Models and Years. It will be a specialty section corded off within the Fall Nationals Car Show that will consist only of 1987 and older import vehicles. There will also be a regular car show that has a category for everyone! So everyone with any type of vehicle any model or year is welcome!!! Here's the link to the pics. You can view the pics even if you don't have a FB account. Share with your friends. Make sure to like the page while you are there! Thanks for the pictures.. That white te51 liftback is beautiful.